Last week, I focused on some of the tax proposals in the 2013 Hawaii legislative session. This week, let’s look at education. Some of the hot-button issues in education include public preschool, mandatory kindergarten, and school safety. One bill stands out for its scope: HB1453 attempts to reform the public education system with a barrage of reforms, such as establishing student-teacher ratios, requiring Internet access, setting teacher salaries, and more. Here are the education highlights from the 2013 Legislative Session. If I’ve missed any important education-related bills, please let me know! There are four proposals that directly affect our students. 1. Early childhood education: HB853 and SB1084 propose a constitutional amendment to establish early childhood education programs. HB862 and SB1093 establish the School Readiness Program. HB864 and SB1095 establish the Early Childhood Education Program. I am concerned that Hawaii cannot afford it and the schools will basically provide state-funded daycare. 2. Mandatory kindergarten: HB14, HB609, and HB1466 make attendance at kindergarten mandatory. If Hawaii can afford it, I think this is a great idea for kids to get a head start for school. On the other hand, are we taking children away from their parents too soon? 3. School choice: SB278 establishes the School Choice Scholarship program to provide students access to nonpublic schools, based upon financial need. This seems like a test-case for a school voucher program, but available to only lower-income children. 4. Peer education program: SB523 establishes peer education programs in Hawaii public secondary schools. Here are five proposals that directly affect our teachers. 1. Empowering teachers: HB684 allows a teacher to exclude from the classroom any disruptive or threatening student. Why do we need a law for this common-sense practice? 2. Adjunct teachers in the classroom: HB1276 allows schools to hire adjunct teachers who are exempt from teacher licensing requirements. This would allow schools more hiring options and encourage more people to consider teaching. 3. Adding to teachers’ workloads: HB1306 requires teachers to get 2 hours of training on human trafficking. SB643 requires teachers to receive cardiopulmonary resuscitation training and certification. Teachers have more than enough to do right now, with teaching, preparation, grading, and extracurricular activities. 4. School debit cards: HB1376 allows school principals to use debit cards to purchase school and curriculum supplies. This sounds reasonable, as long as there is accountability for spending. 5. Income tax credits for teachers: SB573 offers a state income tax credit for school teachers. Nice help for teachers, though it will mean more paperwork, of course. There are six big-picture proposals that affect our schools. 1. Safer schools: HB301 requires classroom doors that lock and unlock under certain circumstances; HB1479 sets up a task force to study the issue. We’re turning our schools into prisons in the name of safety. HB397, SB525, and SB1350 require anti-bullying, anti-cyberbullying, and anti-harassment programs. HB678 limits teacher-student electronic communication (email, social networking) to DOE networks only. HB1295 and SB938 establish the Peaceful Schools Program. HB1477 creates a task force to study school safety. SB701 requires a sexual abuse of children policy and establishes a task force. This is more responsibility, expenses, and paperwork for the schools; but it’s hard to vote against school safety. 2. Healthier schools: HB478 allows schools to grow and consume food from school gardens; HB1243 sets up a task force to study the issue. I don’t think we need “permission” to eat fruits and vegetables that we grow! HB1084, HB1099, and SB1378 require diabetes training for schools with students with diabetes. Isn’t this the responsibility of parents and pediatricians? SB609 requires schools to offer a vegetarian entrée at least once a week. Lunch menus should be left up to the schools and cafeteria managers. 3. Tax incentives for after-school programs: HB569 establishes a tax credit for businesses that sponsor after-school programs. I’d like to encourage businesses and the community to get involved in our schools, but can we ask for their help without offering a tax credit? 4. Local school boards: HB1051 and HB1277 propose a constitutional amendment to establish local school boards. I don’t think it will make a big difference whether it’s a statewide school board or local school boards; it will mean a lot of local input, duplicate work, and more paperwork. 5. Two more years of school: HB1472 raises the age limit from 20 years of age to 22 years of age to provide children with disabilities access to a public education. We need to consider how effective two more years of school will be and whether we can afford it. 6. Electronic-based curriculum tools pilot program: SB1296 establishes an electronic-based curriculum tools pilot program for one public intermediate or middle school. Doesn’t Hawaii have an online charter school that we could study? Please think about these education issues and how they may affect you and everyone around you. If you feel strongly about an issue, speak out! Talk to your family and friends, let your Hawaii legislators know about it, and write letters to the local newspapers. Just last week I talked about getting more involved in government, whether it’s keeping track of bills, submitting testimony, or watching how our elected officials vote. I submitted my first testimony online a few weeks ago. It was surprisingly easy. I didn’t have to register for an account, and I even received an email confirmation. When we attend public hearings and submit testimony in person, I think it has a big impact on lawmakers. But many of us, myself included, may feel uncomfortable standing up in front of a small group and making a short speech. 1. Look your best. The better you look, the more confident and professional you’ll feel, recommends the Editors of Publications Int’l in “18 Public Speaking Tips.” Stand straight and try not to fidget. 4. Capture your audience’s attention from the beginning with an interesting comment or story, suggests the Avery article “Conquering Common Presentation Blunders.” Keep your presentation snappy and use anecdotes to slip in facts and statistics. 5. Speak as if you’re having a conversation, instead of reading or reciting your speech. Take your time. Show your excitement through your voice, facial expressions, and gestures, advises a “Public Speaking Tips” article. If you want to practice your public speaking, check out Toastmasters International. They are a non-profit organization that teaches public speaking and leadership skills. There are 66 Toastmasters clubs in Hawaii! Are you comfortable with public speaking, or would you rather nudge someone else into speaking for you? How do you prepare to speak in public? The 2013 Hawaii Legislative Session is already underway. There are only 60 working days in the session, but in these few months our legislators can have a big impact on everything in Hawaii, from taxes and business regulations to public spending and personal freedom. To get ready for the proposed legislation that is coming our way, here’s some helpful tips to get involved in the Hawaii legislative process. * How can I find out my legislative districts? If you’re registered to vote, you can check your yellow Notice of Voter Registration and Address Confirmation Card. You can also check the Office of Elections 2012 Election Maps. * How do I contact my representative and senator? The Hawaii State Legislature website has a directory of all legislators. * How can I get on a committee’s mailing, fax, or e-mail list? Visit the Hawaii State Legislature website at http://www.capitol.hawaii.gov/, click “Bill Status & Documents,” and click on “Subscribe to Hearing Notices by e-mail”. If you don’t have internet access, you can call or write to the appropriate committee chair’s office to be placed on the committee’s mailing list. * How do I find out about public hearings? The Hawaii State Legislature website lists current public hearings with links to the proposed bills and hearing notices. To receive hearing notices via email, you must register for an account. The account will also let you track measures and submit testimony. * How do I submit testimony for a public hearing? You can submit testimony online through your account with the Hawaii State Legislature by clicking on “Submit Testimony.” For written testimony, follow the instructions on the bill notice regarding the minimum number of copies, and submit it to the appropriate office at least 24 hours prior to the hearing. For the House, testimony should be delivered to the committee vice chair’s office, faxed to the number provided on the committee’s hearing notice, or emailed to the lead committee’s email address. For the Senate, testimony should be delivered to the committee chair’s office, faxed to 586-6659 (Neighbor Islands: 1-800-586-6659) or emailed to the lead committee’s email address. For more information, read the Citizen Participation Factsheet. * Bill Cutoff is the last day to introduce bills. In 2013, Bill Cutoff was on January 24. There was also a Grants/Subsidies Cutoff on January 31. * First Lateral is the last day to move bills to a final committee within each house. Since most bills are referred to more than one committee, this ensures that the referral committees have time to review the bill. * First Decking is the last day to “deck” bills for Third Reading in the original house. “Decking” is the time when the final form of a bill is made available to the Legislature, at least 48 hours before put to a vote. Note: Bills introduced in the 2013 session that fail to meet this deadline can still be considered in the 2014 session. * First Crossover is the last day for Third Reading of bills in the originating house. If it passes, it “crosses over” to the other house for consideration. * Second Lateral is the last day to move “crossover” bills to a final committee within each house (all Senate bills with House referrals, and all House bills with Senate referrals). * Second Decking is the last day to “deck” bills amended by the receiving (non-originating) body. A House-Senate conference committee meets to resolve differences if there is a formal disagreement. * Second Crossover is the last day for Third Reading of bills amended by the receiving (non-originating) body, at least 48 hours after the amended bills were decked. * Disagree is the last day to disagree with the other chamber’s drafts of bills. * Crossover is the last day to pass concurrent resolutions to the non-originating body. If adopted, these concurrent resolutions cross over into the other house for further consideration. * Final Decking is the last day to “deck” bills for Final Reading. * Adjournment Sine Die is the last day of the session and the last day to vote on bills for Final Reading and on resolutions up for adoption. In 2013, Adjournment Sine Die is on May 2. The 2013 Hawaii Legislative Timetable is already posted, so we know the important dates to contact our legislators. If there is a bill or resolution that affects you… if there is an issue that you feel passionate about… please don’t hesitate to submit testimony or contact your legislators. We need to show our legislators that we care about what they are doing and that we are watching their actions. I’ve driven along the Pali Highway, a scenic route through the Ko‘olau Mountains, and rarely thought about the epic battle that took place there. I’ve stood on the concrete platform with the wind streaming around me, and seen the beauty of the valley – but not the last stand of desperate warriors. And until now, I never really thought about the battle as a whole, from the military deployment to what it meant for Hawai‘i. 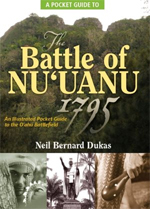 “The Battle of Nu‘uanu 1795: An Illustrated Pocket Guide to the O‘ahu Battlefield” (2010) by Neil Bernard Dukas offers a historical account of the last great battle in Hawaii, a turning point between island self-determination and unification. The account is based on Hawaiian mo‘olelo (story) and mele (chant), journal entries by visitors, and research and interviews by historians. In April of 1795, a great battle was fought on the island of O‘ahu that would change the future of an island nation. The Battle of Nu‘uanu was the last stand of Kalanikūpule and 9,000 warriors of O‘ahu against Kamehameha and his invading army of 12,000 warriors from Hawai‘i. Outnumbered and outgunned, the O‘ahu defenders were already weakened by the Battle of ‘Aiea (Kuki‘iahu) and a failed attempt to seize two well-armed foreign merchant vessels. Kalanikūpule concentrated his forces around the base of Pūuwaina (Punchbowl Crater) and at Nu‘uanu. Kamehameha landed unopposed at Diamond Head. When Kamehameha unexpected infiltrated Papakōlea, a critical line of defense that connects the crater to the base of the ridge heading up to Tantalus, the defenders retreated to Pauoa Valley and then Nu‘uanu. With their strongholds falling and Kalanikūpule wounded, the warriors were demoralized. At Kahuailanawai (Jackass Ginger Pool) in lower Luakaha, the defenders were caught between Kamehameha’s driving army and a flanking force that had crossed over from the back of Pauoa. Pressed back toward Kaholeakeahole (Nu‘uanu Pali), the defenders fought to the death or threw themselves off the heights to avoid capture. Interwoven in the narrative is a glimpse into the personal story of Ka‘iana, one of Kamehameha’s leading warriors, who defected to Kalanikūpule. He was killed at ‘Elekōki (now Craigside Place on South Judd Street), and comforted in his dying moments by his wife Kekupuohi, who had remained loyal to Kamehameha. In the aftermath of the battle, prisoners were sacrificed, land was reallocated and colonized by the victors, powerful family lines ended, and natural resources were strained. Kalanikūpule survived the battle, but was later captured and sacrificed by Kamehameha at the Diamond Head heiau of Papa‘ena‘ena. While the battle didn’t result in a unified kingdom – civil war continued for five more years, and the islands were unified after the peaceful submission of Kaua‘i in 1810 – it was a pivotal battle that changed the islands’ future. With beautiful illustrations and photographs, maps, driving directions, and even invasion routes, “The Battle of Nu‘uanu 1795” brings to life the entire battle from a military perspective. It is easy to read, thoughtful, and balanced. I was sad to read of the destroyed heiau, and distressed to learn that the skeletal remains at the base of the Pali were thoughtlessly obliterated during the construction of the Old Pali Road in 1897. I appreciated the background information on weapons and strategies, but I would have liked more personal stories about Kamehameha, Kalanikūpule, and other prominent warriors. You are currently browsing the Better Hawaii weblog archives for February 2013.